Robert Fyffe Kilpatrick was born in 1893 and was the only son of the Rev. W Kilpatrick M.A. and Mrs Kilpatrick, Edinburgh. 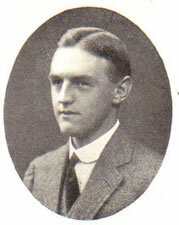 He attended George Watson’s College from 1899 – 1910. He played in the school XV of 1909-1910, and on leaving played in the Watsonians XV as forward. He passed his final Chartered Accountant’s examination in 1915. On enlisting in the 14th A.& S.H., he went to France a year later. In the Battle of the Somme he was severely wounded on 15th September and died in hospital at Rouen on 25th September 1916. He died at the age of 23 and his name was on the WW1 memorial of North Merchiston Church where his father was the minister from the time the church was built in 1896.